Now that Super Tuesday is over, all eyes are on Michigan. Both parties have scheduled debates here in the runnup to our March 8 primary. This would be the perfect time for GOP Gov. 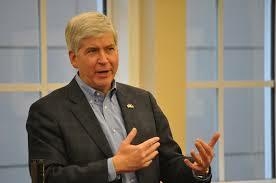 Rick Snyder to grab some headlines about the "Michigan comeback," his favorite topic. And there's no doubt that the economy is on the upswing since he took office in 2011 -- unemployment is down and the business climate has improved (although it's always debatable how much credit governors should get, for good or for ill). Last year, amid breathless speculation that Snyder was running for president, he made a series of out-of-state trips to tell "the Michigan story." Our primary week provides a unique window of opportunity for him to sell our state, as national and international media swarm the Mitten. But Snyder probably won't be talking much about Michigan's comeback this week, which could attract investment and boost our national reputation. He probably won't be highlighting our vaunted "Pure Michigan" tourism campaign. And don't expect Snyder to hit the campaign trail, either, in sharp contrast to other Michigan politicians, like U.S. Sen. Debbie Stabenow (D-MI) and state Senate Majority Leader Arlan Meekhof (R-West Olive), who will bask in the limelight. But neither Snyder nor Lt. Gov. Brian Calley, who hopes to succeed his boss in 2018, have endorsed a candidate for president. That's because the devastating Flint water crisis is dominating everything. Every day brings a new and horrifying story, whether it's about Flint women miscarrying or a resident using bottled water who still tested positive for lead. There may be a few "Flint truthers" out there who still deny the crisis, but they've been quiet lately. Snyder has been badly wounded by the crisis. Reams of emails reveal that his high-ranking staff, including his legal counsel and chief of staff, were well aware of health problems early on, but their concerns were ignored. Snyder has maintained that he didn't know the severity of the Flint crisis until October 2015. If that's true, he appears to be just about the last one in his executive office to know. The other possibility, of course, is that he was told and failed to act. The end result is the same: This is a tragedy for the people of Flint. And while Michigan Republicans stew about Democrats Hillary Clinton and Bernie Sanders swooping in and "politicizing" the crisis, they know that Snyder -- the leader of their party -- is a huge liability right now. That's a problem from the GOP. But it's a much bigger problem for all citizens of Michigan, who have lost their leader and biggest champion. Susan J. Demas is Publisher and Editor of Inside Michigan Politics, a nationally acclaimed, biweekly political newsletter. Her political columns can be found at SusanJDemas.com.